Hi all, the Indian Galaxy ace had only the froyo version available until last month. 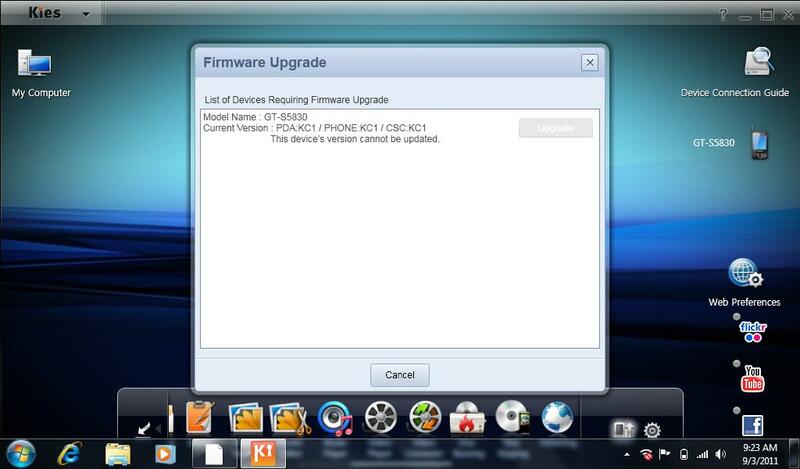 Now that we have a gingerbread update lets see how to upgrade it via kies, the safer way. Android froyo shipped with the phone was version 2.2.1, DDKC1 representing the samsung code for indian region firmware. Now we have an update version 2.3.3 with code DDKQ5 for indian region.Let us go through the steps for updating your phone.Read each and every point carefully. Also the older version have some problems connecting with the samsung servers via certain ISPs and hence shows “no response fron server” error. If it shows so try connecting your PC to internet via another internet service provider.I had ver 1.5 on my cd provided with phone which could’nt find an update for the phone while checking. I couldn’t connect my phone with kies 2.0 in windows XP. 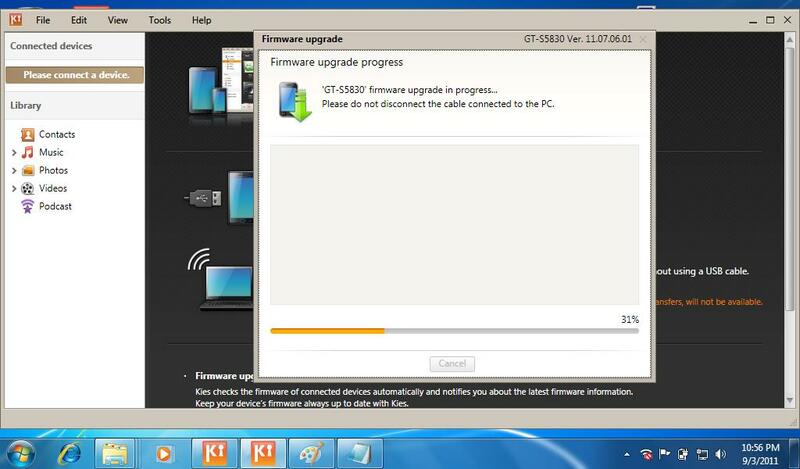 It showed “connecting to device”, endlessly.The easy way is to try your update in windows 7 PC. Luckily i had windows 7 installed and i could connect my phone with ease.If the problem persists you may right click kies icon and select “Run as Administrator”. Please ensure that you have the following conditions met.Other wise there is a chance that you may brick your phone. -Make sure your phone is fully charged or at least more than 50% before connecting to kies. -Those who are using a desktop you must have a good backup ups or make sure you’ll be having uninterrupted mains supply during the process. -Better use a laptop with charger plugged in or with enough power to run for atleast 2hours with your phone connected.If you dont have a broadband connection its better to leave it plugged in as it will take time to download.Update is more than Some 100mb. 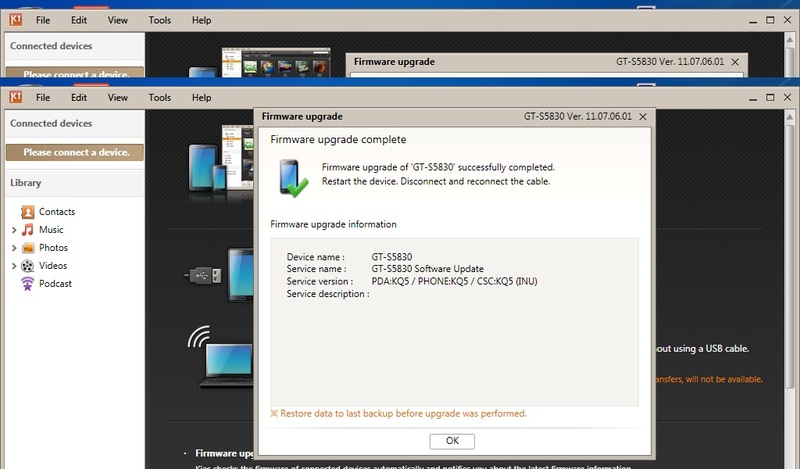 Click on the Firmware Upgrade button in kies and you will be prompted to backup your contact information etc..Do it otherwise you’ll loose them. Dont worry you will not loose your already installed programs while updating. You’ll be getting a screen as shown below. 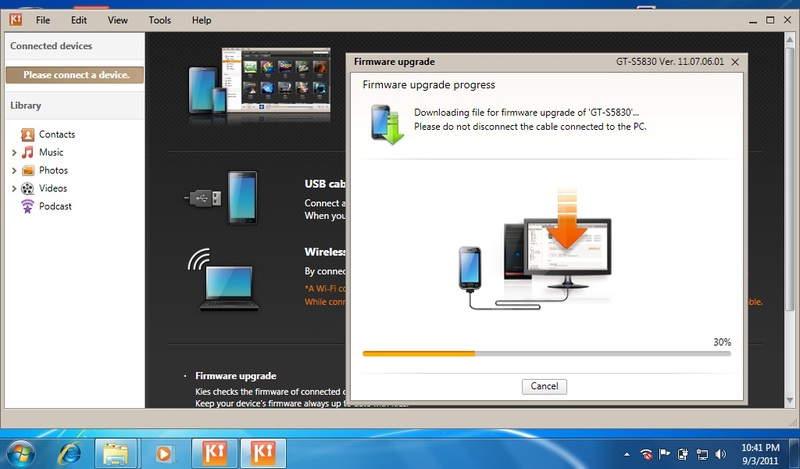 At the final part of upgrading your phone will show “Downloading” text alone on a blank screen.This is the critical part.As shown in kies do not disconnect the phone from PC or interrupt the process. Its safer if you do not attempt to run any other programs in background while the update is running. After the upgrade is complete you’ll get a screen as shown. And thats it. 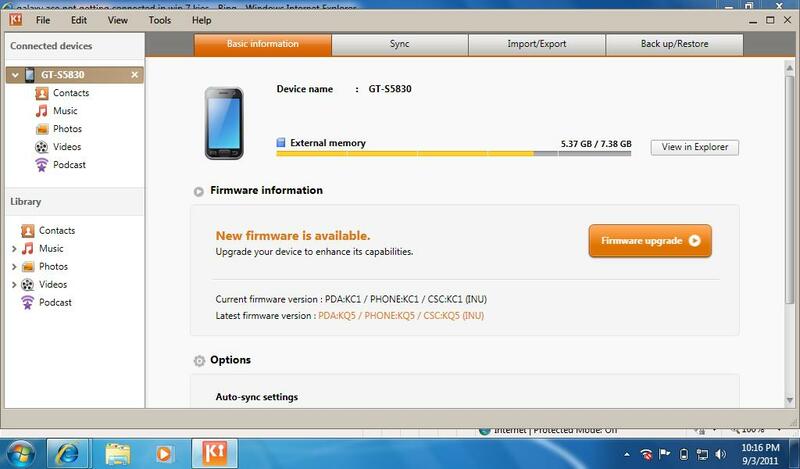 Now restore your contacts through kies (if you did a back up before) and you are now having an updated galaxy ace. Thats all for now.I’ll come up with more beginner friendly articles soon. Entry filed under: Galaxy ace. Tags: EASY UPDATE GALAXY ACE VIA KIES, GALAXY ACE, how to upgrade android 2.2 to 2.3 via kies on ace, UPDATE GALAXY ACE GINGERBREAD, UPGRADE GALAXY ACE INDIA KIES. Hello world ..! What is ClockWorkMod and what will i get if i install it..